Think about what it’s like when you talk to homeowners who are remodeling for the first time. They don’t know exactly what they are getting themselves into when they turn part of their house over to you for several months. If you’re smart, you’ll explain the process and the possible pitfalls (such as dust), step-by-step, reassuring them that this will be a smooth ride because you are a clean contractor who cares. Homeowners are most concerned about the health of their family and pets and their personal belongings. They appreciate contractors who share those priorities, which puts clean contractors a step ahead of the competition. For example, ask your clients if they have a child with asthma. When you’re sensitive to a family’s medical issues it builds your relationship with the homeowner, so that it’s not just about getting them to sign on the dotted line. About 90 percent of homeowners remain in the home during remodeling, which is why keeping them safe from inhaling potential harmful particles is a huge priority. 81 percent of homeowners believe job site dust is the worst inconvenience of remodeling, according to a study by MMR Research Associates, Inc.
68 percent of homeowners who have completed a remodeling project were displeased with how dust was managed, according to the same study. HOW CAN YOU BECOME A CLEAN CONTRACTOR? The first steps to becoming a clean contractor are to follow best practices and to incorporate the newest technology and equipment into your dust control plans for clients. 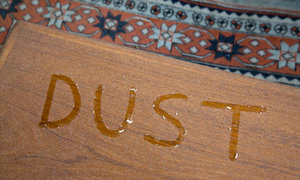 You’re already using some tried-and-true methods to control dust. Once you obtain the most effective and latest equipment, such as an air scrubber that can remove almost all airborne dust from a worksite, you will have the centerpiece of a dust control plan that will impress your clients and decrease your crew’s cleanup time. Then, you’ll need to train your team. To become known as a clean contractor who cares about the health of clients in addition to the quality of work, you need to make sure your entire team is on board. Sales staff, construction managers, designers, front-line workers – everyone needs to live the “clean” life. Help them understand the importance of dust control and how to talk to prospective and current clients about it to ensure your edge on other contractors. Finally, make your dust control plan an effective marketing tool, differentiating you from your competition. Your craftsmanship has already won over your clients’ business, now make them come back for more (and tell all their friends about how amazing you are). Reducing the amount of dust from a home creates a more livable environment for your clients and helps eliminate the health hazards associated with jobsite dust. For example, to a family of three with an asthmatic child air quality is a top priority, no matter the price tag. Make sure your website assures potential clients that you follow dust control best practices. You’ve established your reputation, now it’s time to tell your story. See how dust control can really sweep away the competition and amp up your sales pitch. Pun definitely intended.